Hello and welcome to my blog! I like to use this space to showcase cards which I have made in the past. I'm posting many in a short amount of time in order to catch up and be able to showcase all the cards I've made up until this point. These two are the same design with a little difference, these are super fun and easy to make, only it does take a lot of cardstock! And I think it looks very elegant. 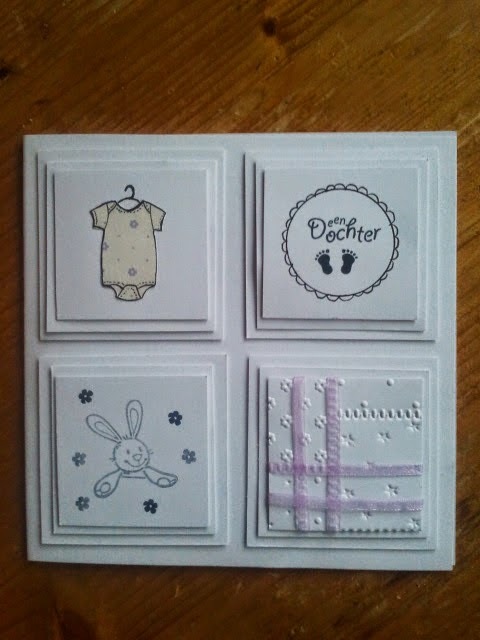 I used the Marianne Design COL1313 stamp for the bunny, the boofle embossing folder for the embossing on the left one and just cut out a onesie by hand and drew in the lines with a black pen. The "een dochter" stamp with the feet is from a stampset I bought so long ago I no longer know where I got it. This is a twisting easel card. As you can see there are lots of girls in my circle of friends and family. 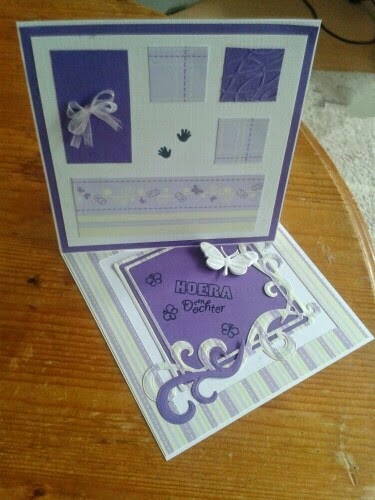 I used the Leane Creatief die frame square curve Leane007 n 45.8114 for the swirls and the frame of the bottom half of the card, Joy butterfly die and that unknown stampset again. The design paper is by Marianne Design I think. And I used the Cuttlebug scrollwork embossing folder on one of the squares. This is also a good scraps card. This card was very fun. 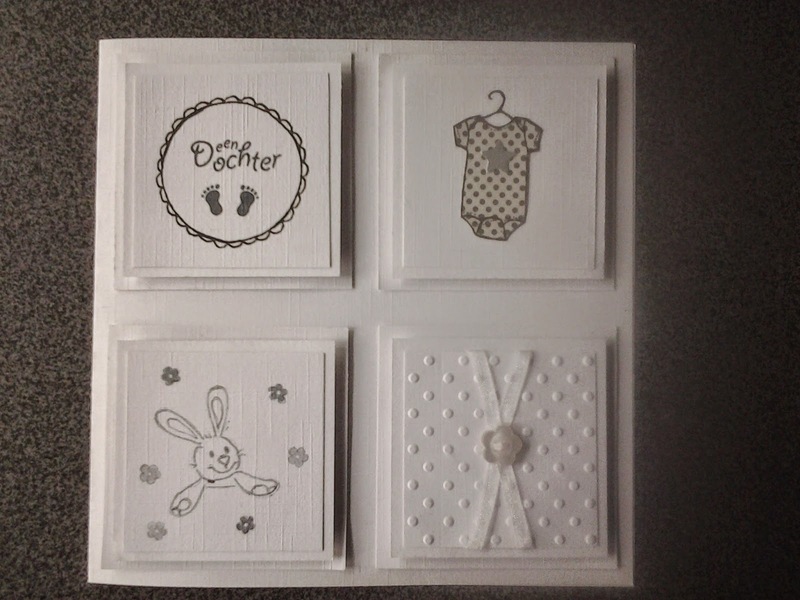 I used Marianne Design COL 1313 for the baby, MD COL1315 for sentiment, the MD CR1239 for the frame and Forever Friends designer paper. Here's a boy's card (finally) haha. Again used the MD CR1239 for the circle, COL 1325 for the banner and LR0188 for the buttons, which is some paper with washi tape on it (cheating!) I used Distress Ink Chipped Sapphire for the banner as well to give it some colour and the bottom design paper is Forever Friends while the top I have no idea. The ribbon is from the Hema. Hope you feel inspired and check ya later!